The matching tuner for the Beolab 1700 amplifier. In most respects a conventional design and offering identical performance to the Beomaster 1100 receiver, it is difficult to see why these models were offered. Text copyright © Beocentral. Unauthorised reproduction prohibited. The styling was very much in the mould of the Beomaster 5000 tuner of 1968, an obvious difference being that the front panel was black instead of natural aluminium. Text copyright © Beocentral. Unauthorised reproduction prohibited. Preset tuning was included, though curiously only 3 selections were available, in contrast to 4 on the Beomaster 1100 and derived types. There were also technical differences in the pre-set tuning circuitry which, despite an elaborate stabilising circuit, was left powered all the time, even when the off button (which acted to cut off the main regulator, another unusual feature) was pushed. Text copyright © Beocentral. Unauthorised reproduction prohibited. 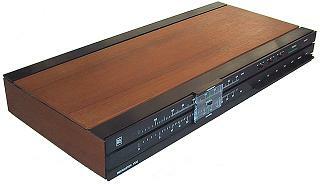 Two outputs were provided, for an amplifier and a tape recorder. One of these outputs included a level control, which took the form of a small spindle on the rear panel. Text copyright © Beocentral. Unauthorised reproduction prohibited.